Let’s face it: Not all Houston air conditioning companies are honest. Some will try and use tricky billing policies to charge you for materials you didn’t ask for, quote you for jobs they never complete properly, or just flat out lie boldly to your face. Most people aren’t HVAC experts, hence the reason they call on Houston air conditioning companies to service their systems. It’s hard enough to find a provider that is reputable and with the ever-increasing presence of the internet, many people turn to customer reviews online. Here’s where the lying gets really creative and deceptive—some Houston air conditioning companies engage in creating fake positive reviews for their business. Businesses that engage in this deceptive tactic often have a common conspirator—online review mills or a group of their peers and employees. In the case of review mills, these vendors charge companies to create fake reviews using dozens of shell usernames on apps such as Yelp, Google and Facebook. The reason they do this is to bump their listings on apps like these to rank higher when customers search for terms such as “Houston air conditioning company” or “Houston AC Repair.” Most people filter by most favorable reviews and this tactic deceitfully helps them fall into that category. But just when you are thinking there’s no hope—There’s Airteam. Here to help you sort out the authentic five-star reviews from the fakes, we aim to keep the HVAC industry honest and fair. We take great pride in the multitudes of positive reviews we have earned from customers both old and new. Keep reading to learn how to spot honest reviews and avoid a dishonest Houston air conditioning company seeking a quick score from unsuspecting customers by making their own “great” reviews. One of the easiest and most basic ways to avoid the swamp of fake reviews is to stick with well-respected sites that are moderated heavily for spam and fake reviews. Sites such as Yelp, Angie’s List, the Better Business Bureau, and more have moderators that review content for possible fakery. However, keep in mind this is just a basic step—despite their moderation even these sites have fake reviews that don’t get caught before you come across them. So, read on to find out how you can get a better feel for a fake review and weed them out yourself. If a Houston air conditioning company has only a handful of reviews, that in and of itself is not a bad sign—they might just be a small provider. However, if their reviews are all posted over a small time frame such as two or three days or even a week—that is a sure sign the reviews are likely manufactured and fake. It’s an old saying, yes—but the wisdom is very relevant when it comes to online reviews. When a real customer writes a review of a Houston AC repair company, they give details—whether the review is bad or good. Think about it, even when you see bad reviews they give a lot of detail, in fact, usually more detail than good reviews! When people have a good experience with an HVAC provider in Houston, they like to mention details about the service, mention the tech that helped them and the problems they were having. A fake review typically will not have that level of detail and will be very generic. Marketing people that provide review services are horrible bluffers, they can’t help but sound like an ad when writing fake reviews for their dishonest clients. If the review sounds like something you’d find in an ad or marketing piece—you can be sure it is likely fake. Who talks like that in real life casual conversations? If you really want to be a bit of a detective, look at that reviewer’s profile and read their other reviews—we’ll bet you the cost of a service call they all sound alike. Here’s the dirty part about the Houston AC repair business—competition can get dirty. At Airteam, we let our reputation speak for itself and take credit for the good jobs we do—and when we get a bad review, we take responsibility for those too. Some providers, however, use the tactic of sabotage and will write a fake review about their competitors that is harshly negative. The easy way to spot these fakes is that they always point you in the direction of a “better” company (aka, their own). When you write a negative review about a company do you ever throw in a random plug for a company you think is better? Not likely, you are so focused on letting everyone know how bad of a job they did you aren’t even thinking about anyone else. Bottom line, bad reviews that plug the competition are almost always fake. Stop Sifting Through Fake Reviews—Get The Best With Airteam! Listen, you can sift thru dozens of reviews trying to sort out the real ones from the garbage or you can do yourself a favor and call the best in the business. Airteam relies on earning our reputation—not paying a bunch of marketing guys to manufacture glowing reviews. Our customer’s satisfaction IS our glowing review and you can’t fake that. 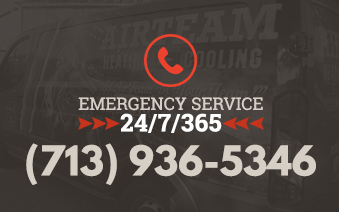 Contact us today and see why we are your champions for Houston heating and air conditioning! PreviousPrevious post:Balancing Act: How To Avoid Hot & Cold Spots In Your HomeNextNext post:What Does the R22 Refrigerant Phase Out Mean For Your HVAC System?